NBC News, "How to Save Money at Costco (and Avoid Overspending), According to Shopping Pros", By Dana McMahan, October 13, 2018. Woman's World Magazine, "Have More Halloween Fun for Less! ", October 16, 2017. KPRC NBC 2, Houston, TX, 11 work from home jobs that pay at least $12 an hour, By Amy Davis, September 21, 2017. Chicago Tribune, "8 online shopping hacks that will save you money", By Danielle Braff, July 26, 2017. The New York Times, "How to Save Money (and Hassles) on Your Black Friday Shopping", By Christopher Mele, November 18, 2016. MarketWatch, "This is how savings experts do their holiday shopping", By Maria LaMagna, November 18, 2016. Money Magazine, "50 Ways to Save for Holiday Shopping", By Andrew DePietro, November 1, 2016. KPRC NBC 2, Houston, TX, "Find big savings at TJ Maxx stores this week", By Amy Davis, June 27, 2016. Money Magazine, 'Score a Big Retail Deal', By Lisa Lee Freeman, June, 2016. 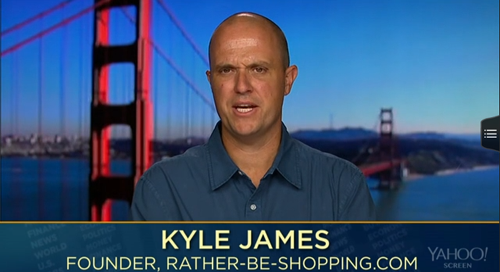 Card Rates.com.com, Meet Kyle James: How the Man & Voice Behind Rather-Be-Shopping.com Helps Shoppers Become Better Savers (Full Interview), By Ashley Dull, May 2, 2016. WMC-TV, Memphis, TN, Secret deals to save you thousands on Amazon.com (Skype Interview), By Andy Wise, April 29, 2016. WNDU-TV, South Bend, IN, Ways to Save on Amazon, (Skype Interview) By Christine Karsten, March 22, 2016. Huffington Post, "15 Surprising Things You Can Buy From Amazon", By Cameron Huddleston, March 21, 2016. CBS4 Denver, Denver, CO, Secrets To Saving Money On Amazon (Skype Interview), February 23, 2016. NBC News, "Romance That Doesn't Break the Bank: How to Save on Valentine's Day", By Nicole Spector, February 12, 2016. WMC-TV, Memphis, TN, App gets stores to match Walmart's low prices (Skype Interview), By Andy Wise, February 11, 2016. WCPO-9, Cincinnati, OH, Stores that will accept expired coupons, By John Matarese, February 1, 2016. MarketWatch, "Why Super Bowl week is one of the best times to buy a TV", By Maria Lamagna, January 31, 2016. WREG CBS 3, Memphis, TN, Consumer Alert: New price matching policies help you save, (Skype Interview) By Zaneta Lowe, January 21, 2016. WAVE3-News, Louisville, KY, 19 stores that will price match Walmart (Skype Interview), By Eric Flack, January 18, 2016. WTVD/ABC11, Raleigh/Durham, NC, Money Saver: 19 stores that will price match Walmart (Skype Interview), By Amber Rupinta, January 15, 2016. Forbes, 5 Surprising Things You Can Negotiate From Interest Rates To Medical Bills, By Cathie Ericson, January 14, 2016. WSOC-TV, Charlotte, NC, Three suggestions for a bigger TV for NFL playoffs (Skype Interview), By Jason Stoogenke, January 12, 2016. KPRC NBC 2, Houston, TX, How to get warehouse club prices without a membership, By Amy Davis, January 7, 2016. WBTV, Charlotte, NC, Expert Shares Tricks to Lower Cable, Phone Bills (Skype Interview), By Kristen Miranda, November 15, 2015. FOX 19 Now, Cincinnati, OH, These are the Days to Save Big on Holiday Gifts (Skype Interview), November 11, 2015. WAVE3-News, Louisville, KY, Some Days Offer Better Shopping Deals than Black Friday (Skype Interview), By Eric Flack, November 11, 2015. WFMY 2 News, Greensboro, NC, Pre-Black Friday Sales - Are They Worth It? (Skype Interview), By Lechelle Yates, November 11, 2015. Good Housekeeping, 'Here Are All the Stores That Will Price Match Costco', By Lauren Smith, October 27, 2015. CBS Money Watch, "7 Little-Known Holiday Savings Tips", By Cameron Huddleston, October 23, 2015. RedBook Magazine, '10 T.J. Maxx Shopping Hacks That Will Save You Major Money And Time', By Kayla Keegan, October 2015. Woman's World Magazine, "Help Me Save More at the Big Box Stores! ", September 28, 2015. Family Circle Magazine, 'Back-to-School Savings Guide: Shop smarter this season', By Amy Leibrock, September 2015. WREG CBS 3, Memphis, TN, Amazon vs. Jet: Battle for the best bargains, (Skype Interview) By Zaneta Lowe, August 13, 2015. 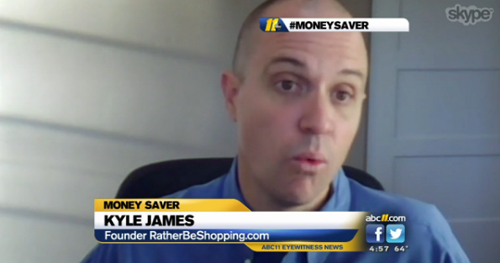 WSOC-TV, Charlotte, NC, How Shopping Experts Save Money on School Supplies (Skype Interview), By Jason Stoogenke, August 11, 2015. WFMY 2 News, Greensboro, NC, Learn How to Stack Coupons and Save Money (Skype Interview), By Lechelle Yates, July 21, 2015. WNDU-TV, South Bend, IN, Amazon Prime Day offers thousands of "lightning" deals, (Skype Interview) By Kate Chappell, July 14, 2015. ABC News, Amazon Prime Day: 31 Deals Available Starting Tonight, By Susanna Kim, July 14, 2015. CBS Dallas-Fort Worth, Expert Breaks Down Best Days To Shop Online, By Ginger Allen, July 8, 2015. CBS4 Denver, Denver, CO, Blogger Finds Great Ways To Save Money At Starbucks After Price Increase (Skype Interview), By Britt Moreno, July 7, 2015. The List TV, "Awesome Summertime Deals", by Brien McElhatten, June 29, 2015. ABC News, Saving Money: Day of Week, Time of Year Can Bring Discounts, By Elisabeth Leamy, June 8, 2015. WTVD/ABC11, Raleigh/Durham/Fayetteville, NC, Best Days of the Week to Shop Online and Save (Skype Interview), By Amber Rupinta, May 25, 2015. WMC-TV, Memphis, TN, The Investigators: Best days to shop online (Skype Interview), By Andy Wise, May 19, 2015. KHOU 11, Houston, TX, Watching Out For You: Best days to shop (Skype Interview), By Tiffany Craig, May 4, 2015. Shop Smart Magazine, "51 Insider Saving Secrets", May 2015 Issue. WGN Morning Show, Chicago, IL, "Kyle James has tips on how to lower your cable and phone bills", (Skype Interview), April 20, 2015. WTVD/ABC11, Raleigh/Durham/Fayetteville, NC, Money Saver: Ways to Save on Spring Break Travel (Skype Interview), By Amber Rupinta, February 18, 2015. Inside Edition, Shopping Tips Guaranteed To Get You The Lowest Price Every Time, February 16, 2015. KGO 810 Radio, Michael Finney Show, San Francisco, CA, Use Subscribe Programs to Save Money (On-air interview), February 7, 2015. CBS Money Watch, "The best way to get bargains when buying in bulk", By Mitch Lipka, February 2, 2015. NBC 12, Richmond, VA, More Bang For Your Buck: Subscribe and save or buy in store? (Skype Interview), By Jennifer Warnick, January 30, 2015. Woman's World Magazine, "Negotiate your Way to January Bargains", January 19, 2015. KPRC NBC 2, Houston, TX, "Do-it-yourself shopping tips to save at IKEA", By Amy Davis, January 7, 2015. Money Magazine, 'How to Save Dough Online', By Ismat Sarah Mangla, December, 2014. NBC 12, Richmond, VA, Experts pinpoint best days to buy presents for the holidays (Skype Interview), By Jennifer Warnick, December 12, 2014. WNDU-TV, South Bend, IN, Best days to shop before Christmas, (Skype Interview) By Kate Chappell, December 12, 2014. Woman's World Magazine, Ask America's Ultimate Experts: "Help me take the stress out of gift shopping! ", December 5, 2014. WKMG Local 6, Orlando, FL, How to find best Cyber Monday deals (Skype Interview), By Eryka Washington, November 30, 2014. Forbes, 10 Sneaky Online Shopping Tricks For Scoring Major Discounts, By Deborah Jian Lee, November 27, 2014. 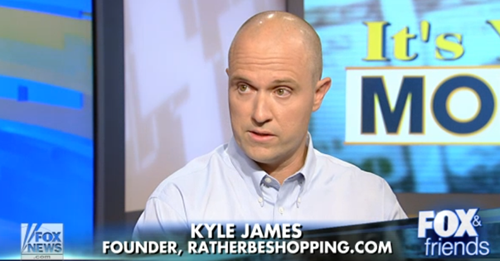 WGN Morning Show, Chicago, IL, "Kyle James with Black Friday deals and smart shopping", Skype Interview, November 24, 2014. WMC-TV, Memphis, TN, Find Better Than Black Friday Deals (Skype Interview), By Andy Wise, November 19, 2014. 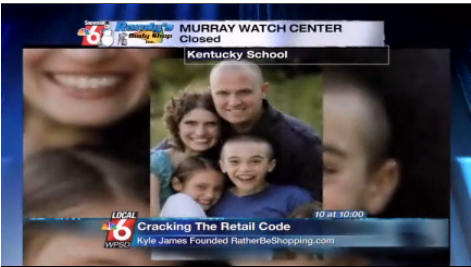 ABC Nightly News, "Price Tag Secrets: Cracking the Retail Code", By Cecelia Vega, November 16, 2014. WPBF 25, West Palm Beach, FL, What NOT to buy on Black Friday (Skype Interview), By Erin Guy, November 12, 2014. CBS Boston, WBZ-TV, "What Days Are Best To Find Retail Bargains?" (Skype Interview), By Kathryn Hauser, November 5, 2014. WREG CBS 3, Memphis, TN, Free Shipping for your Christmas & Holiday Shopping, By Zaneta Lowe, November 4, 2014. KPRC NBC 2, Houston, TX, Dozens of Stores offer Free Shipping with No Minimum Purchase, By Amy Davis, October 27, 2014. CBS Philly 3, Philadelphia, PA, 3 On Your Side: Insider Tips On Store Markdowns, Skype Interview, By Jim Donovan, September 25, 2014. Yahoo! Finance, "What to say to score discounts at your favorite retailers", Skype Interview, September 24, 2014. WGN Morning Show, Chicago, IL, "What are the best days to shop? ", Skype Interview, September 11, 2014. Woman's World Magazine, Ask America's Ultimate Experts: "Help! I hate paying full price! ", September 8, 2014. FOX & Friends, FOX News, "How to Crack the Retail Code", In-Studio Interview, September 5, 2014. Good Morning America, "Want to Shop Like an Insider and Get the Best Deal at Retail? ", September 3, 2014. Kiplinger.com, '5 Favorite Web Sites for Finding Shopping Deals', By Cameron Huddleston, August 14, 2014. CBS Dallas-Fort Worth, Back To School Shopping: 7 Tips To Help You Save (Skype Interview), By Ginger Allen, August 8, 2014. My FOX Orlando, Orlando, FL, Last minute back-to-school savings (Skype Interview), By Kimberly Wiggins, August 4, 2014. WAVE3-News, Louisville, KY, Easy ways to save money on back-to-school shopping (Skype Interview), By Eric Flack, July 29, 2014. CBS46, Atlanta, GA, Re-cracking the price code: When best to shop the clearance rack (Interview), By Jennifer Emert, July 21, 2014. WREG CBS 3, Memphis, TN, Shop by the clearance calendar (Skype Interview), By Zaneta Lowe, July 18, 2014. KDFW Fox DFW, Dallas, TX, On Your Side: Markdown Days (Skype Interview), By Steve Noviello, July 02, 2014. Yahoo! Finance, Secret price codes of top retailers, By Morgan Korn, May 21, 2014. 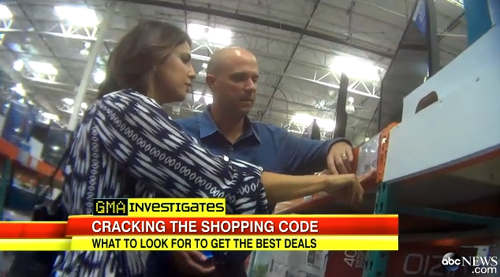 ABC News, California Dad Says He's Cracked the Code to Smart Shopping, By Susanna Kim, May 2, 2014. Reuters, Learn the secret codes to shopping success, By Lou Carlozo, April 16, 2014. CBS Philly 3, Philadelphia, PA, 3 On Your Side: Cracking Price Tag Code (Interview), By Jim Donovan, February 5, 2014. KLAS-TV CBS 8, Las Vegas, NV, 8 on Your Side Cracks Retail Price Codes (Skype Interview), By Michelle Mortensen, February 3, 2014. WTVD/ABC11, Raleigh/Durham/Fayetteville, NC, How to Crack Price Tag Codes (Skype Interview), By Amber Rupinta, January 28, 2014. The New York Times, 'More Retailers See Haggling as a Price of Doing Business', By Hilary Stout, December 16, 2013. CBS Radio Chicago - WBBM, Chicago, IL, "Noon Business Hour" (On-Air Interview), December 16, 2013. 710 KNUS News/Talk, Denver, CO, "Kelley & Co." (On-Air Interview), November 27, 2013. NBC King5, Seattle, WA, Jesse Cracks the Costco Price Tag Code (Skype Interview), By Jesse Jones, November 21, 2013. Pocono Record, Shopping on Turkey Day: Clever capitalism or 'Un-American' greed?, By Stacy Brown, November 18, 2013. MarketWatch, The Wall Street Journal, Never Pay for Shipping Again, By Catey Hill, November 7, 2013. 6abc Action News, Philadelphia, PA, Money-Saving Apps for Summer Travel, By Amy Buckman, May 27, 2013. CJAD 800 Montreal News Talk Radio, "The Tommy Schnurmacher Show" (On-Air Interview), March 13, 2013. MSN Money, 'Skip the flowers -- she wants a smartphone', By Donna Freedman, February 11, 2013. The Financial Fitness Radio Show, 'Holiday Couponing' (On-Air Interview), hosted by Chip Cummings, November 24, 2012. KJRH News2, Tulsa, OK, 'Site promises to help you stretch your Online Shopping Dollars', By Michelle Lowry, November 20, 2012. Forbes, 'More Holiday Shopping Savings Tips', By Marcia Brixley, October 22, 2012. Carroll County Times, 'Coupon Corner: New app brings coupons to your iPhone', By Karen Silverman, October 17, 2012. Philly Burbs, 'Want a Beautiful Home for Less? ', By Beth Allen, August 31, 2012. MSN Money, 'Online shopping codes: Virtual coupons', By Donna Freedman, August 28, 2012. The Oregonian, 'Bargain Shopper: Have fun at the fair for free' By Kym Pokorny, August 24, 2012. The Denver Post, 'Plugged In: A new side for online coupon codes' By Kevin C Keller, July 16, 2012. The Financial Fitness Radio Show, 'Extreme Couponing' (On-Air Interview), hosted by Chip Cummings & Tony Rubleski, May 12, 2012. 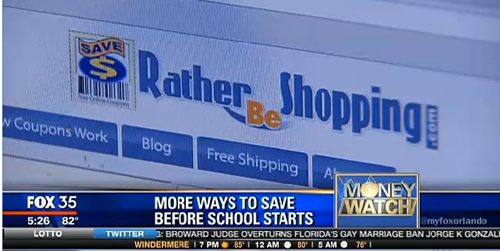 Fox10 TV, 'Save Green with Rather-Be-Shopping.com', By Derica Williams, January 4, 2012. The New York Times, 'Holiday Shopping at the Last Minute? No Worries Online', By Stephanie Rosenbloom, December 14, 2011. The Daily Campus @ SMU, 'I'd Rather-Be-Shopping', By Stephanie Brown, December 6, 2011. Dayton Daily News, 'Preparing for Black Friday . . . and Gray Thursday', By Robin McMacken, November 19, 2011. Woman's World Magazine, 'Resession Busters! ', page 24, October 31, 2011. 6abc Action News, Philadelphia, PA, Save Money with Free iPhone Apps, By Amy Buckman, September 21, 2011. The Wonder of Tech.com, Rather-Be-Shopping.com: Your Personal Site for Savings, By Carolyn Nicander Mohr, September 21, 2011. MSN Money, Costume Swaps: An 'eek-o-friendly' alternative, By Donna Freedman, September 16, 2011. 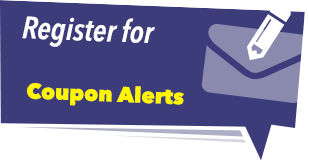 MakeUseOf.com, 3 Tools To Create A Price Drop Email Alert, May 23, 2011. WTOP 103.5 FM, Washington D.C., 'Website of the Week', December 8, 2010. WTAE-TV, Pittsburgh, PA, 'Extreme Savers' Scrimping Leads To Big Bucks', By Andrew Stockey, November 2, 2010. MSN Money, 'Nab a $19 discount in 80 seconds', By Donna Freedman, June 9, 2010. Today Show.com, MSNBC, 'Dining on a dime: 10 tips to save at restaurants', By Laura T. Coffey, February 10, 2010. Out In The Country Magazine, Summer 2009, 'Untangling The Web, Search and Save', By Jennifer Douglas, Summer 2009. Today Show.com, MSNBC, 'Save Now! 10 Tips to be a Better Coupon Sleuth', By Laura T. Coffey, July 29, 2009. The Tennessean, 'Peruse these sites and never again pay full price', By Mary Hance, aka Ms. Cheap, March 8, 2009. The Boston Globe, 'Bargain Blogs and Websites', Boston.com, December 1, 2008. WTAE-TV, Pittsburgh, PA, 'Protecting Your Money: Web Sites Reveal 'Secret Discounts' To Savvy Shoppers', By Aaron Saykin, November 24, 2008. The Hartford Courant, 'Surfing For Savings At Bargain Websites', By Korky Vann, November 18, 2008. Reader's Digest, 'More Ways to Get a Great Deal on Anything', By Andrea Cooper, November 2008. CBS 13, Sacramento, CA, 'Save With Dave: "Rather Be Shopping" Website', October 30, 2008. KHSL 12 Action News, Chico, CA, Wake Up! Morning Show, (In-studio live interview), October 23, 2008. KRCR Channel 7, Redding, CA, 'Online Coupons, Rather-Be-Shopping.com', Reported by Shannon Handy, October 14, 2008. Reader's Digest, 'Get A Great Deal On Anything', By Andrea Cooper, October 2008. Jumping Monkeys w/ Megan Morrone, 'Episode 63: School Anxiety', September 14, 2008. World Start.com, 'Amanda's Cool Site Of The Day', August 21, 2008. KSDK NewsChannel 5, St. Louis, MO, 'Web Site Of The Day', February 18, 2008. Cool Site Of The Day.com, 'Site Of The Day', February 12, 2008. Redding Record Searchlight, 'Man Finds Job That Clicks', By Marc Beauchamp, January 8, 2007. Los Angeles Daily News, 'Blogging For Dollars', By Barbara Correa, October 29, 2006. Nine FM, Chicago, Illinois, Steve & Joey Morning Show (On-Air Interview), November 16, 2006. Hot Mix 101.9, Fayetteville, AR, "The Jay and Brock Morning Show" (On-Air Interview), November 17, 2006. WWYL FM WILD 104, Binghamton, NY, The Morning Show with Kirsten & Riley (On-Air Interview), November 22, 2006. MSNBC, 'Electronic 'elves' can unwrap online bargains', By Gayle B. Ronan, December 7, 2006. WBRE TV, Wilkes-Barre, PA, 'Surfing For Savings', By Jeff Chirico, December 8, 2006. KIOA 97.3 FM, Forest City, Iowa, Kit Cameron Show (On-Air Interview), October 7, 2005. KICK 104 FM, Rapid City, South Dakota, MOJO Morning Show (On-Air Interview), October 18, 2005. Nine FM, Chicago, Illinois, Steve & Joey Morning Show (On-Air Interview), October 20, 2005. WNWN 98.5 FM, Kalamazoo/Battle Creek, MI, Dewey & Amy Morning Show (On-Air Interview), October 27, 2005. WWYL FM WILD 104, Binghamton, NY, The Morning Mess Morning Show (On-Air Interview), November 2, 2005. His Radio WRTP, Greenville, SC, "Wake up with Rob and Kristin" (On-Air Interview), November 11, 2005. Like Rock 95.9, Cookeville, TN, "After Hours @ 5 with Anita Fox" (On-Air Interview), November 15, 2005. Hot Mix 101.9, Fayetteville, AR, "The Jay and Brock Morning Show" (On-Air Interview), November 22, 2005.